Last year we acquired an old, upright piano. It was a Cable-Nelson, built around 1915. It was really pretty – but in really bad shape. The previous owners had put $600 worth of work into it, but it still needed lots of work. I had estimates of repair anywhere from $340 – $1000. It just wasn’t worth it in my opinion. We could buy a new piano for that! 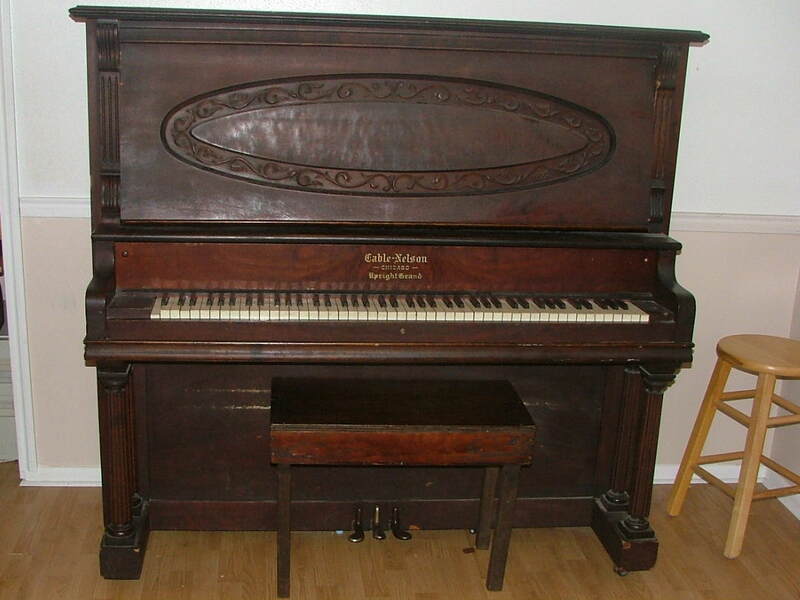 Long story short – the Cable Nelson was sold for $50 to John Talbot who refinishes antique pianos and turns them into Player Pianos! He’s a very talented craftsman and musical technician! So, goodbye Cable Nelson. It’s been nice playing with you – but your days with small children banging your keys in unrythmical patterns is behind you. You are off to the Retirement Home that most pianos would DIE for! Enjoy your new life! Can’t wait to see what becomes of you! And now – in it’s place is a beautiful Vose & Sons piano that our new piano teacher basically gave to us! (As photographed BY HANNAH!) It fits our living room so much better. The Nelson was a full upright. This one come just above the chair rail. It is Maple in color and has pretty little details. The keys are in GREAT condition and feel wonderful on your fingertips. The bench is awesome – it won’t tip over so easily like the other one. I actually want to learn to play! And the tone is beautiful. Not as deep and rich as the Nelson, but not as chime-y (is that a word?) and airy as so many other piano’s I’ve tinkered around on. I’m in love. I won’t deny it. Thank you, God, for your provision! It truly was an answer to prayer! You are ever-faithful to meet ALL our needs, but it’s the unexpected blessings that make having You as a Father so much fun! And here’s Hannah “Mozart” Walston – she was so upset yesterday when the Nelson was hauled off. When she came into the living room and found the new piano – she ran to it, hugged it’s leg and started giggling for JOY! Then she wouldn’t leave it’s side for at least 10 minutes and had to have her photo taken with her new piano! She asked for lessons, too. (Both boys will be starting lessons soon.) I told her I’d give her lessons and she was THRILLED with that idea! May it fill your home with many hours of beautiful music!